When you undergo a site move, it is standard to set up 301 redirects from the old domains to the new ones. While many recommend leaving those redirects in place permanently, in practice this isn’t always an option or even if it is needed. The question came up about redirects and John Mueller from Google addressed how they would ideally like to see 301 redirects handled in these kinds of situations. 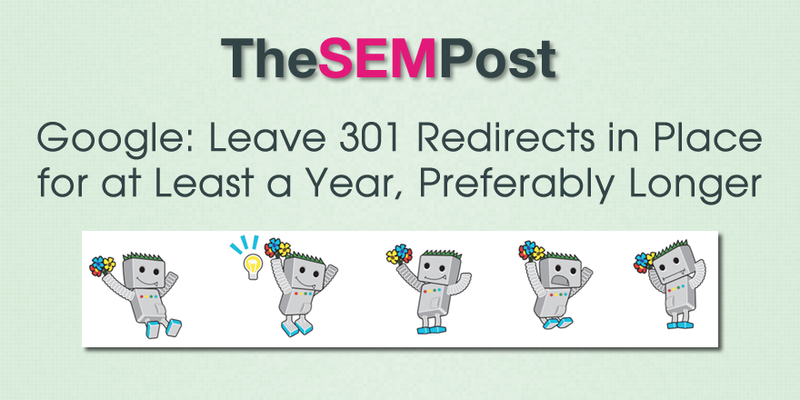 So from our point of view, when we look at 301 redirects and permanent site move situations, we do expect that 301 redirect to be there for the long run. So that could be something maybe a year, or ideally even longer than a year, so that we can really be sure that everything that was pointing at the old URLs is pointing at the new URLs. And also if users are going to those pages directly, through bookmarks that they might have saved, through old links that are out there on the web, then they might still be kind of clicking on those old links and they expect to land on the final page. Ideally, you would have that redirect there for a long run, but I know from a practical point of view at some point you have to say oh, it’s finished, we can’t pay the domain name anymore, the other guy wants to do something else with the domain name, so at some point you are going to cut that off, but I’d really aim for something at least like a year. And if you have access, you can look at the server logs and see how many people are actually being redirected there. And if you notice after a year there’s still a lot of normal people being redirected, maybe you can figure out how they are reaching the old domain, is it like an important link you forgot to get updated on the web, is it just lots of people with bookmarks and you can’t really fix their own bookmarks, that’s kind of what I would aim for there, at least a year. If you are redirecting from a former domain, such as with a name and site rebrand, unless there is a reason you can no longer use the old domain, you should continue to keep redirects in place as long as there are still links pointing to the old URLs, or until you can see no traffic is going through those redirects any longer. And some just leave them up even beyond that if they have no reason to remove it.